The 7th chakra healing meditation brings you in touch with the Divine by living in the present moment. It is through prayer, meditation and contemplation that this emotional and energy center can be our great spiritual connector! 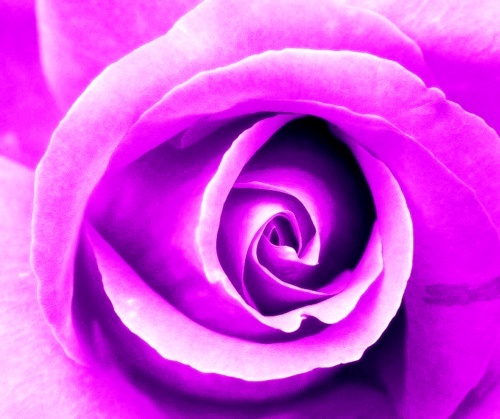 Violet is the color of the 7th chakra energy. It is the color at the end of the rainbow, the bridge between our self and the Divine.The swirl of the rose, its perfect vortex of unfolding beauty, is the symbol I have chosen to represent the subtle and internal energy that lifts us through our spiritual nature to a Higher Power. You are all spiritual beings and opening to this energy through this chakra healing meditation will bring you closer to God. To better understand this subtle energy within you, please refer to my article, Chakra Yoga. As we ascend the spinal column, we reach the highest vibrational energy, perhaps that which is the most subtle, to access the spiritual realm. In this energy center you embody your spiritual nature so that you can receive guidance. In order to embody, or make real, your spirituality, you have to have a way to access the Divine. It is only through intention and focus that you access your soul, and the Divine Light within you. Therefore, the 7th chakra is the chakra of prayer. Caroline Myss, PhD, my favorite author on the subject, calls the 7th chakra, or the crown chakra as it is also known, your "Grace bank account." What she means by this, is that you directly receive from your bank account, that which you put into it. In other words, the more energy you expend showing acts of faith, kindness, compassion and love, and the more time you spend in prayer, meditation, and contemplation, the more "energy" and guidance you can withdraw! Isn't this a lovely metaphor? Is your Grace bank account full or empty? It is through our spiritual energy that we have true insight, receive true love and guidance and experience things of a mystical nature. An open and healthy crown chakra allows us to directly experience the Divine. Learning this chakra healing meditation can be an entry point for you, in this extremely personal task. The basic right of the seventh chakra is to find your own personal, spiritual nature by releasing the past, letting go of the fear of the future, and learning to live in the wisdom and comfort of the present moment. The sacred truth of the 7th chakra is "Live in the Present Moment." Connection to the Divine, where your soul is one with God, is an extremely personal task. Only you can be present with yourself and with God. Your church cannot do it for you, neither can your "religion." Religion, churches or any type of group belief is the realm of the first chakra. The energy of the first chakra is primarily to protect the group, while the energy of the seventh chakra is to find individual spirituality regardless and in spite of the group. The basic right of this energy and emotional center is to express your individual spirituality, without group protection, without a mediator, but resting in the truth that you can experience the Divine intimately for yourself. Individual spirituality reaches its zenith, only in the silence of the present, when you release yourself from fear and when you open yourself to receive guidance regardless of the changes that consciousness asks of you. As stated earlier, the color of the 7th chakra is violet and it is often referred to as the "crown" chakra, because it is located at the top of the head. When one is fully enlightened, according to the yogic tradition, the many petaled lotus flower is in full bloom.This lotus flower sits on the top of the head, a powerful symbol of cosmic consciousness. The Sanskrit name of the seventh chakra is "Sahasrara" meaning "thousandfold." The life of enlightenment, full of Divine intelligence is rich indeed and is the seat of the source of all manifestation. The number "1000" in this symbology represents infinity, not a finite number. It is wise to remember that energy always flows in two directions, within the subtle body, and within every yoga pose. In order to find Divine consciousness, and unity with God, energy must be firmly rooted in the Earth, with all foundational and basic needs being met. When this condition is fulfilled, your grounded Earth energy flows from the base of your spine, upwards, meeting the crown chakra at the top of your head, and then flows upward and out to connect with the Power of Divine Intelligence. Conversely, from the Divine source, energy is received and flows downward, from your crown to the base of your spine to create change in yourself, and in the physical world. The source of all knowledge and wisdom where "ideas" originate, creates the energy required for its manifestation to be fulfilled in the physical here and now. The specific mantra of the brow chakra is "I know." Indeed, the basic element of the crown chakra is thought and its manifestation is information and personal understanding. I wish I could say that I am enlightened in the full energy of the 7th chakra. I am not. I have only glimpsed its power in my life. When I see the full power and beauty of the Divine source of all consciousness, I suppose I will already have merged with it. 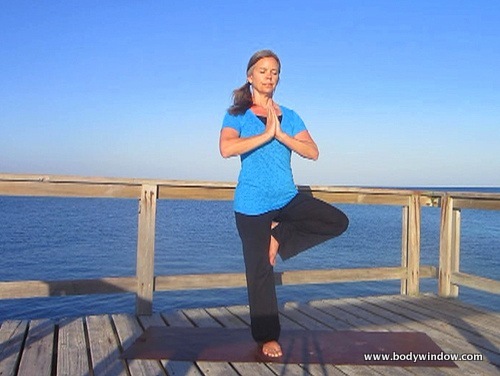 Single point of focus and concentration - imperative in performing the Tree Pose ~ West Bay, Roatan, Honduras. Because the 7th chakra is a highly spiritual area, the physical conditions involve one's entire being and entire systems within the body. The gland that is representative of the seventh chakra is the pituitary gland, known as the "master gland" in the medical world. It is located deep in the center of the brain, and controls all the other glands in the body and their resultant secretions of the hormones in the body. The pituitary gland and the 7th chakra energy control all the systems of the body, both physically and energetically. A poorly functioning 7th chakra manifests itself in the central nervous system, the muscular system or the skin. This is because one's entire life force energy, or "prana" or "chi" is received through the crown chakra and distributed throughout the other six chakras. Specifically, the cerebral cortex and higher thought processes may be disturbed. Energetic disorders like chronic exhaustion that is not linked to a physical disorder, extreme sensitivities to light, sound and/or environmental conditions, as well as mystical depression are all possible physical manifestations of this energy center. Most probably, the deeply spiritual nature of fibromyalgia is also a manifestation of energy blockage here. The single most common thing I see when working with my clients and myself, is that we all fail to understand that the energy of the crown chakra, in connecting to the Divine, is an abundant and limitless source! We are all so accustomed to pushing so hard, with our brains and our minds to force our wills, that we close down this powerful energy system. We think we can do it all ourselves. Is it any wonder that those with an unbalanced crown chakra, have energetic disorders? It is because they are exhausted from trying to change their worlds on their own! Instead they sink into a world of depression, physical illness and powerlessness. The way to tap into Divine energy, is to constantly return to meditative practices and prayer, like my featured chakra healing meditation, to keep this energy channel open. It is only through repeated devotional practices, done on a DAILY basis, that you will open your 7th chakra. And believe me, I am preaching to myself when I say this, because it isn't easy to maintain a daily devotional practice. It is my hope that my 7th chakra healing meditation, below, which has helped me stay focused, can help you as well. Ultimately, your brain will fail you. I promise this! When you let go of the intellect, the "goal-oriented" struggle, you will find the power of the limitless energy from God, through your crown chakra. This will involve the release of your greatest fear, that the Divine guidance and intelligence will take away your finances, your personal identity, your security, your family, or whatever else you (I) am afraid of losing. "God is love, and he who is in love is in God and God in him." ~ Meister Eckhart, "The Soul is One with God." The classic "Dark Night of the Soul" as entailed by great mystics such as St. John of the Cross, in the 16th century, describes the spiritual crises of feeling abandoned by God. It is when you feel that your prayers are unanswered and you question any Divine movement in your life at all. It is a spiritual crises, designed by a Higher Power, to bring you even closer to its power ~ eventually. In this spiritual crises, which I, myself have endured to a very small extent, you feel disconnected with just about everything. Not only do you feel disconnected with God, but disconnected from yourself, from life and from all those around you. It is a very dark and lonely place. Different people feel different levels of isolation and loneliness. This dark night of the soul may last days, months or years. I was lucky, and never fell into total despair, but for some more fleeting hours, as I had a few spiritual friends who understood and were there to support me. My dear sister, my spiritual director and spiritual soul mate, and my husband, my emotional and physical soul mate, were both there for me to ease my spiritual pain. You can recognize if you are in a spiritual crises. The first recognition comes when suddenly your life seems to no longer have any purpose or meaning. I distinctly remember a particular event in my life where this occurred. Regardless of what you try to re-arrange in your life, the feeling that your life is empty and you long for more, just will not leave. A new job, a promotion or a higher salary is no longer sufficient to fill this longing. The second way to recognize you are in a spiritual crises is if you no longer "know" yourself. You can no longer make decisions that were so easy before, because you no longer know what it is you want out of life. This is a kind of loss of self and your self-identity as you know it. And third, you feel a need for devotion to something, anything that brings meaning back into your life. For me it was searching for "community" and belonging to a group. I had abandoned the church many years ago as limiting and unfulfilling. I was desperately looking for a way to feel belonging to a higher purpose. I had all this backwards. The energy of the 7th chakra is energy that is individual, not group-oriented. It is the first chakra energy that is tribal and "group mind" oriented. In seeking the inclusion into a community, I was missing the whole point. What I was truly seeking and what was missing, was my devotional practices that would enable the saturation of the seventh chakra energy that I needed! I now know that in order to stay on my pathway to Unity with Divine Power and Light, that I must spend time, each and every day in devotional practices. This soul work is individual and can never, never be replaced by a community or group. (This does not mean that communities and groups do not have value. It is just of another nature, entirely). A Chakra Healing Meditation Photo for Your Crown Chakra. This photo was taken at the Colorado National Monument, Colorado. According to Caroline Myss, PhD, the energy connection to our emotional and mental bodies, in the 7th chakra, will generate in us, transcendent ideas, mystical connection, inspirational and prophetic thoughts. As I suggested above, this speaks to me of great devotion. I have certainly a long way to go, to achieve this type of union with God. It is seeing God in everything. It is casting Light on everything. From each dark thought, each dark experience, one sees the opportunity for the Light to enter. This process is what St. Teresa of Avila, the great 16th century mystic nun, spoke of as the process of illumination. What an amazing and wonderful concept! I see this repeatedly in my own life. As I learn to surrender, more and more into holding the discomfort of the darkness, and the unknowing, something bright and perfect eventually reveals itself to me. Something I would have not had the ability to see, if I had forced the situation. To rest in this unknowing, is so counter-culture, because we all have such strong and forceful wills that drive us forward. For those whose wills are crushed, or who have weak wills, they tend to strive for the stronger and stronger will, when it is surrender to this cosmic consciousness that will provide the most for us. Being fully conscious, fully present in the moment, to the Divine in all of us, as we open our energy to receive the abundant and illuminated power from God, is evidence of an open and highly energetic seventh chakra! It is my desire that this chakra healing meditation will assist you in your journey to find your true spiritual nature. I designed it intentionally to be contemplative and devotional in its practice. My chakra healing meditations are unique in that they use body movements and yoga poses to open and balance your chakras. The true origin of yoga was to open the body for a spiritual and devotional practice for meditation. This is my goal for this chakra healing meditation, especially, for the 7th chakra, that is of spiritual essence. May you find unity with God as you practice this chakra healing meditation, and may you tap into the power of your seventh chakra as you heal your energy body, your physical body and your spiritual body! 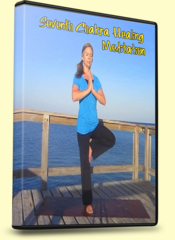 When you purchase this chakra healing meditation, you will receive an email with a link to two downloads. The first is a link to a PDF file with the instructions for the movements in the video. The second link is to the meditative video. The video was designed to be contemplative and meditative, so please make sure to read the instructions first, as the video has no instructions in it.